The Coin Branch of the Royal British Legion held its annual Photographic Competition at La Parilla de Pepe on Wednesday the 20th of March. The subject was Doors and submissions were judged in a single category that was open to all branch members. First place was awarded to Kerry Newell for a photograph of a quaint door framed by two huge trees. Second place went to Rosie Brown and third to Monique Mansfield. 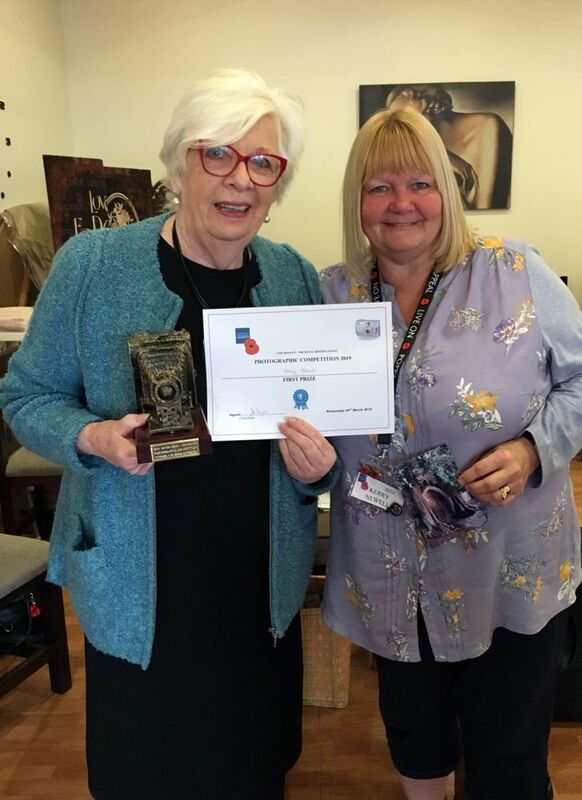 Chairman Jo Taylor thanked everyone for submitting photographs of such a high standard and awarded the Chairman’s choice trophy to Rayah Felgate for a quirky loo door picture. The lucky winners will keep their trophies until March 20. 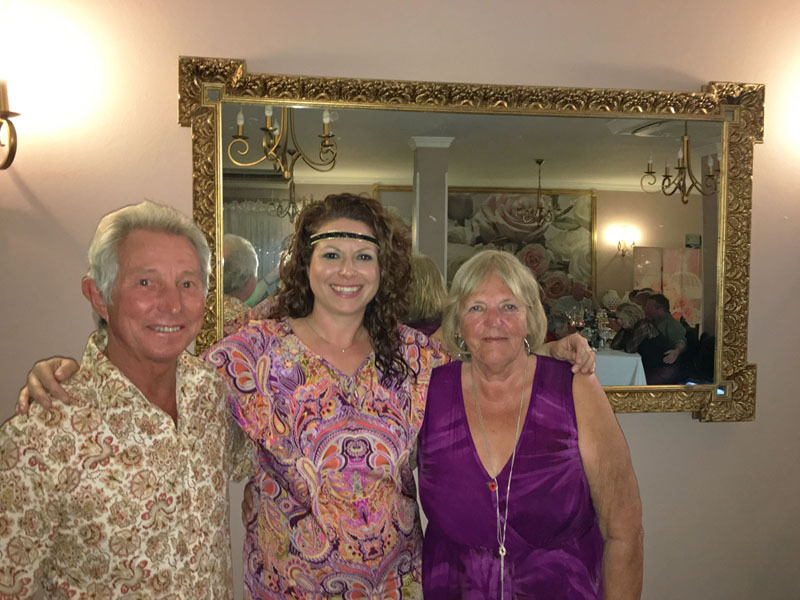 On Saturday the 2nd of March, forty-six members and guests of the Coin Branch of the Royal British Legion thoroughly enjoyed an ABBA-themed dinner dance in aid of the 2019 poppy appeal at Las Carolinas in Alhaurin El Grande. Perfect entertainment was delivered by the versatile and talented Juliet Williams, who really is much-loved by everyone in the Coin Branch. The staff at Las Carolinas played their part too with an excellent three-course meal served with a smile. At the end of the evening, public relations officer Charles Edwards commended organisers George and Marion Chaney and captured this photograph of them with the amazing Juliet Williams in the centre. The next big event is a dinner at Alhaurin Golf Club on 23rd of April to celebrate Saint George’s Day. Fifty-four members and guests of the Coin branch of the Royal British Legion gathered at 11am at La Parilla De Pepe on the 16th of January to celebrate the branch’s 13th birthday. 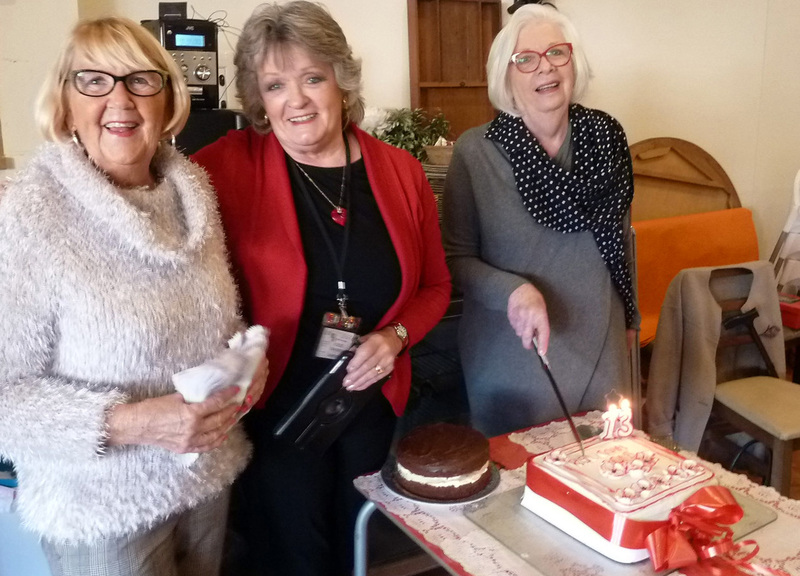 To mark the occasion, Jean Merry (left) baked a fantastic fruit cake and Rosie Mahoney (centre) used her extensive icing skills to produce a culinary delight that both looked good and tasted delicious. In accordance with tradition, Chairman Jo Taylor (right) cut the cake for everyone to taste and auctioned a big piece for the poppy appeal. After wishing the Branch a happy birthday and leading a round of applause, Jo Taylor told the story of January 2006 when 6 people formed the Coin branch and curiosity got the better of 46 people who turned up to see what this new venture of the Royal British Legion in Spain looked like. They must have been impressed because the branch membership in January 2019 stands at 134. The next big social event is an Abba night on Saturday the 2nd of March at La Carolina in Alhaurin El Grande. The function is in aid of the Poppy Appeal and includes a meal and live entertainment for just €20. If anyone would like to join the party see George Chaney to book your ticket. Forty-eight members and guests of the Coin Branch of the Royal British Legion enjoyed a paella dinner dance at La Tavola by Miky in Sierra Gorda on Friday 22 June 2018. Poppy Appeal Officer George Cheney, ably supported by his wife Marion, showed the guests to their pre-assigned seats and the entertainment commenced partway through the meal. Lesley Harrison, who is becoming a firm favourite with the Coin Branch, performed an eclectic selection of songs from years gone by and enjoyed incredible audience participation. Just about everyone left La Tavola wondering just who was Alice. Chairman of the Branch, Jo Taylor, acknowledged all the hard work that had gone into organising the evening and thanked George and Marion on behalf of everyone there. At the end of the night a very tidy 213 Euros had been raised for the Poppy Appeal. The Coin branch has a full entertainment programme right through the summer, details of which can be found at http://www.coinrbl.info/. Why not take a look and consider joining one of the most active and friendly groups in the area? On Thursday the 24th of May, two teams of dedicated quizzers from the Coin branch of the Royal British Legion gathered at the Ginger Pig Country Pub in Coin to try and retain the coveted Michael Taylor Trophy they won in Loja last year. 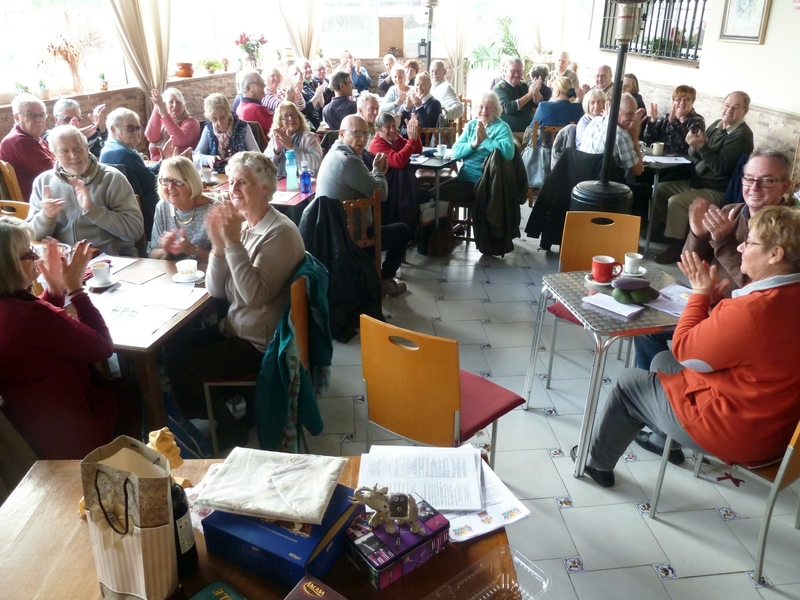 Quizmaster Bob Felgate set the questions and was ably assisted by Rayah Felgate and Val Gardener throughout the day. Seventy two people took part in the quiz and against strong opposition from Loja, Molina, Los Romanes, Torremolinos and Mijas Costa, Coin team A claimed a very close victory just one point clear of Loja. Congratulations go to team captain Perry Spencer together with Russel Riggs, Frances Knowles, Tom Sawyer, with Harry and Kerry Newell. In another close contest Coin team B, Peter and Rosey Brown, Heather Riggs, Ian Matthews, Jan Smith and Jo Taylor, won the open section beating Los Romanes C by just one point. To top off a brilliant day of quizzing the raffle raised 217 Euros for the 2018 Poppy Appeal. The challenge is on; can Coin retain the trophy in 2019? Fifty-one members and guests of the Coin Branch of the Royal British Legion gathered together under a clear blue sky for the annual breakfast at Rosie’s at 10am on Friday the 18th of May. For the first time ever the breakfast represented two special occasions commemorating the 2018 Armed Forces day and celebrating the Royal Wedding to be held the following day. The meal got underway with a glass of ice-cold orange juice freshly squeezed by PRO Charles Edwards from two huge crates of oranges kindly donated by local grower Bartolome Rojano Madrid. Jean Merry and Maureen Ramayon, cleverly disguised as Prince Harry and Megan, served the hungry diners a superb selection of food prepared by a team of thirteen highly-trained cooks and bottle washers ably directed by Peter Brown. Diners could choose whatever they wanted from the full list of English breakfast ingredients sourced once again from T&S Butchers in Coin. At the end of the meal Chairman Jo Taylor thanked everyone for coming along and helping to raise over 200 Euros which will go to the 2018 Poppy Appeal. She also thanked the breakfast team for producing such a sumptuous meal with style and a smile. If you would like to join this group why not consider coming along to a Paella Evening in aid of the 2018 Poppy Appeal on Friday the 22nd of June at 19:30 for 20:00 at La Tavola by Miky in Sierra Gorda. Lesley Harrison will be there to entertain with popular songs from the 1950’s to the noughties. Meat paella (with an alternative) plus a selection of desserts is included in the ticket price of 15 euros. Tickets are available from George on 666 721090. The Coin Branch of the Royal British Legion held its annual Spring Fair at La Parilla de Pepe on Wednesday the 18th of April. Around fifteen of the sixty members present entered seventeen individual categories including best spring floral arrangement, best spring photograph, best spring creation and best spring collage, painting, drawing or colouring. Other categories included best jam, marmalade or chutney and best decorated cake or cup cake. 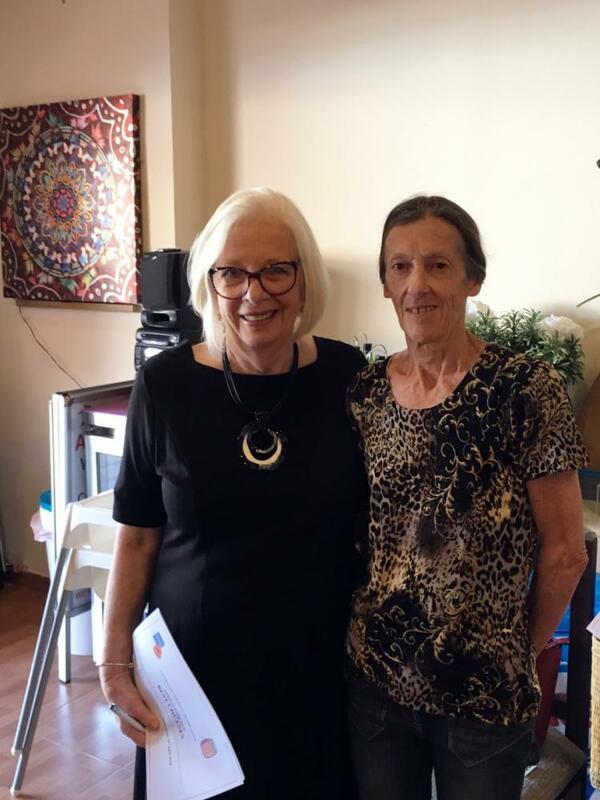 There were too many winners to list but the extremely talented Rosey Brown, seen here being congratulated by Chairman Jo Taylor, secured top spot by winning six of the seventeen categories. 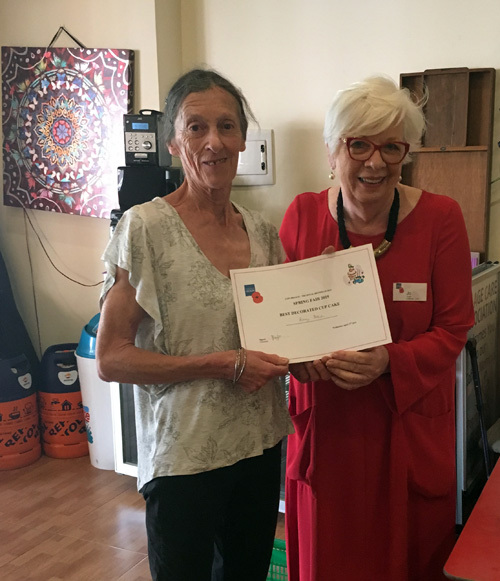 Everyone who entered had put a lot of work into their submissions and Jo Taylor sincerely congratulated all those who took part and thanked them for getting into the spirit of the Coin RBL Spring Fair. 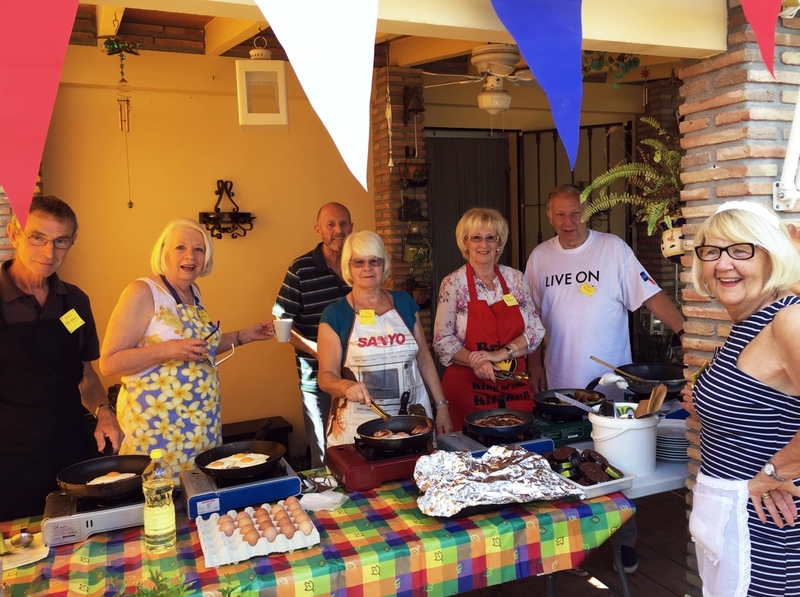 If you would like take part in such activities come and meet the people who make up the Coin Branch of the RBL at La Parilla de Pepe just opposite La Trocha at 11am on the first and third Wednesday of every month. Fifty-five members and guests of the Coin Branch of the Royal British Legion celebrated Valentine’s Day with a dinner dance at La Tavola by Miky on Friday the 9th of February. Poppy Appeal Officer George Chaney struck a terrific deal with Miky and everyone enjoyed a superb two course meal plus live entertainment for 15 Euros a person. The entertainer for the evening was Lesley Harrison who was helped along by her friend Alicia Lane. Towards the end of the evening the Valentine couples were bashing the balloons around the room and having way too much fun. Alicia commented that it was that it was more like a kid’s party than a senior citizens dinner dance. 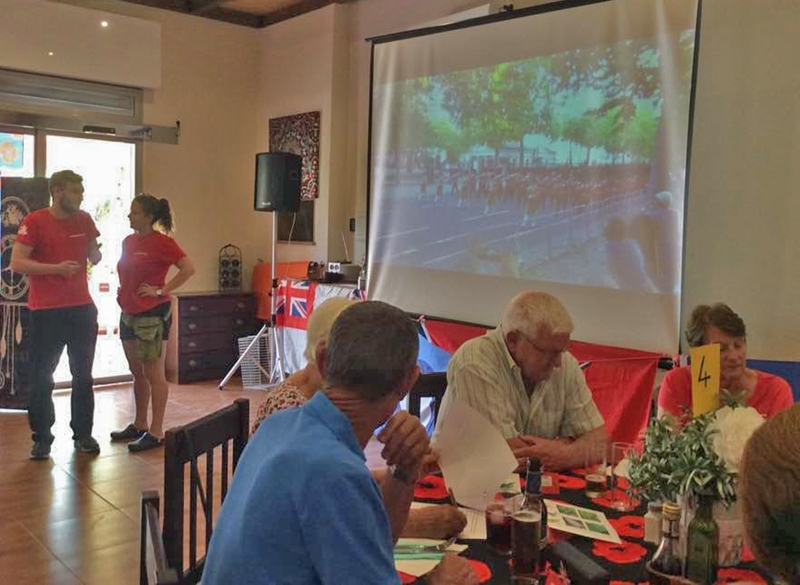 Whatever the case, the function raised 304 Euros for the 2018 Poppy Appeal. The Coin branch has a full entertainment programme right up to Easter, details of which can be found at http://www.coinrbl.info/. Why not take a look and consider joining one of the most active and friendly groups in the area? 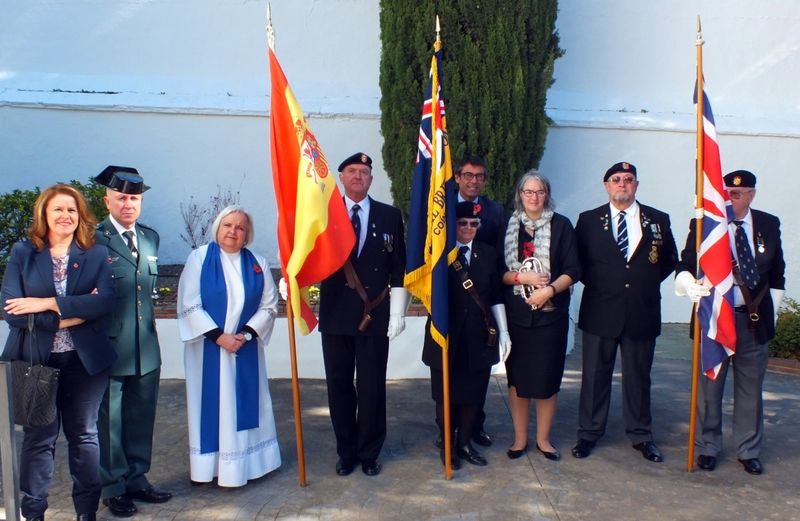 Forty-six members and guests of the Coin branch of the Royal British Legion gathered at 11am at La Parilla De Pepe on the 17th of January to celebrate the branch’s 12th birthday. 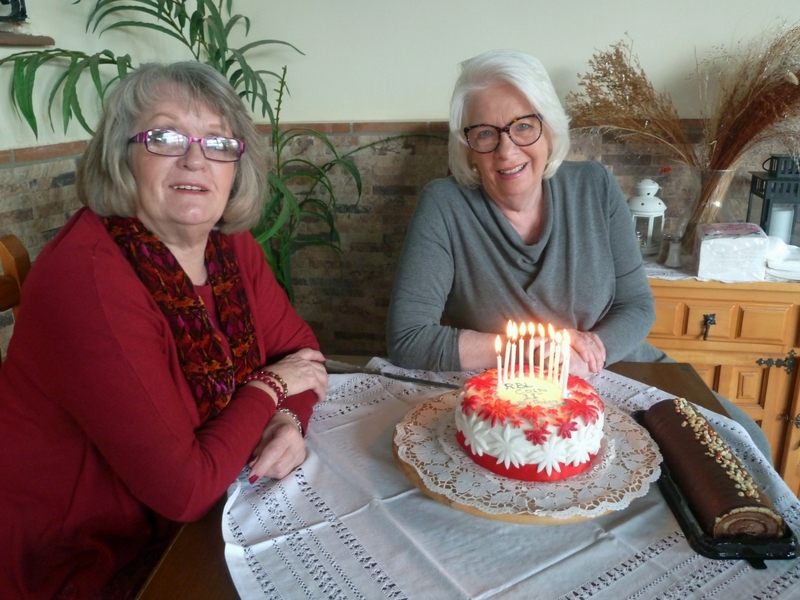 To mark the occasion, Jean Merry baked a fantastic fruit cake and Rosie Mahoney used her extensive icing skills to produce a culinary delight that both looked good and tasted delicious. After wishing the Branch a happy birthday and leading a round of applause, Jo Taylor reminded everyone that not all the members were well enough to celebrate. She made special mention of Vice Chairman Jim Cross who was very poorly and translator extraordinaire Maria Paz Edwards who was currently undergoing heart surgery. Jo wished them both a speedy recovery. The next big social event is a Valentine Party on Friday 9 Feb 2018 at La Tavola by Miky in Sierra Gorda. The function is in aid of the Poppy Appeal and includes a two course meal and live entertainment for just 15€. 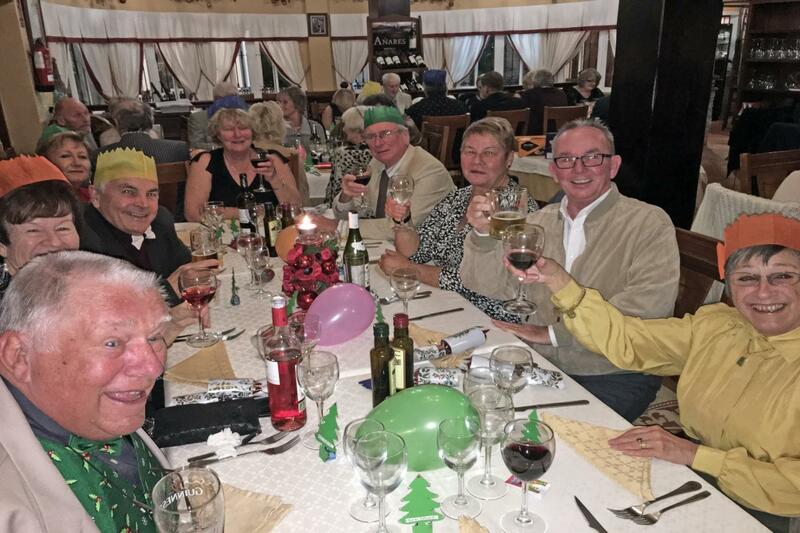 Fifty-seven members and guests of the Coin Branch of the Royal British Legion launched the festive season with a Christmas Dinner Dance at Los Candiles on Thursday the 7th of December. Perfect entertainment was delivered by the versatile and talented Juliet Williams, who really is much-loved by everyone in the Coin Branch. Chairman of the Branch, Jo Taylor, acknowledged that a lot of hard work had gone into organising the evening and paid tribute to Jean Merry, Maureen Ramayon and Rosie Mahoney who decorated the dining room and made table arrangements that set everyone’s festive spirits soaring. The branch also took the opportunity to celebrate their very successful 2017 Poppy Appeal year. In October the Poppy Launch and Autumn Fayre raised €865 and in November generous donations and the money collected in poppy boxes totalled €3191. This brought the overall sum raised by the Coin branch in 2017 to a magnificent €8874. The Coin branch has a full entertainment programme right up to Christmas, details of which can be found at http://www.coinrbl.info/. Why not take a look and consider joining one of the most active and friendly groups in the area? Coin Cemetery Chapel was almost filled to capacity by 11.30am on Saturday the 11th of November when members of the Coin branch of the Royal British Legion gathered together with friends to pay their respects to all servicemen and women who lost their lives in conflict. As in previous years the congregation was in awe of the Tapas choir who sung a beautiful selection of songs before the Service started. The Mayor of Coin, Fernando Fernandez Tapia-Ruano and his fellow councillors were enthralled and complimented the group on their performance. The branch chairman Jo Taylor started the Service with an address in Spanish and English which included for the first time a welcome to Captain Bernade Moya Ortiz of the Civil Guard in Coin. The branch’s chaplain Caroline Macfarlane then led a poignant Service with the theme of Women in the Armed Forces. On a beautiful sunny day everyone’s spirits were truly lifted by an amazing all-round effort by the Coin Branch. For the first time in Coin Cemetery Chapel the Last Post and Reveille were played on a cornet by the Coin Standard Bearer’s daughter Annette Spokes Ellis. Annette can be seen here beaming with pride as she stands side-by-side with the outgoing Poppy Officer Paul Pritchard, Standard Bearers Marian Ellis, Chris Smith and Charles Edwards together with Caroline Macfarlane and the distinguished guests from the Council. 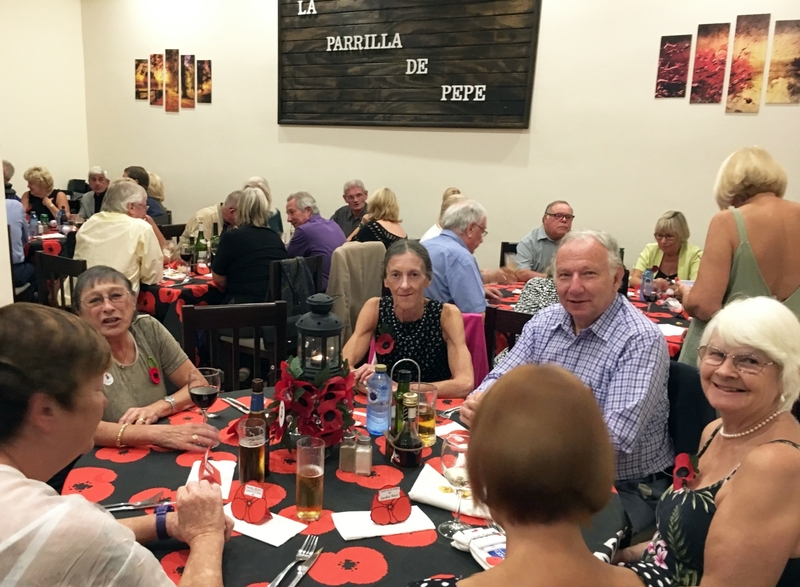 Fifty members and guests of the Coin Branch of the Royal British Legion launched the 2017 Poppy Appeal with a dinner dance at La Parilla de Pepe on Saturday the 28th of October. Retiring Poppy Appeal Officer Paul Pritchard, ably supported by his replacement George Chaney, orchestrated an amazing evening that raised €406. 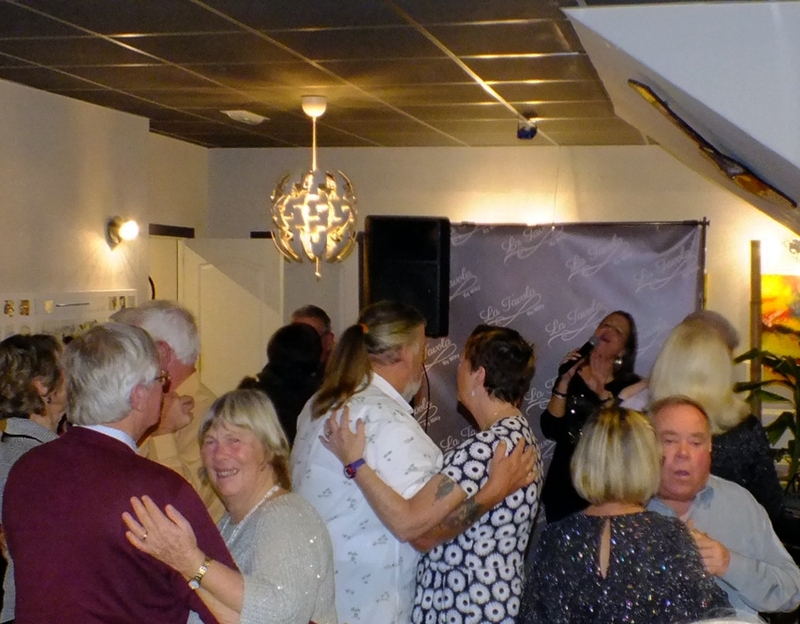 Karen Kooper entertained the diners with a fantastic selection of songs from the 50’s and 60’s that everyone instantly recognised but could not always remember the artist or group that made them famous. Towards the end of the meal emerging star Ricky Leach, a firm favourite with the Coin Branch, joined Karen in several excellent duets. After the meal and raffle Karen returned to the microphone to continue the fun while the more-active members of the branch danced the night away to a popular selection of songs. Chairman of the Branch, Jo Taylor, acknowledged all the hard work that had gone into organising the evening and paid special tribute to Rosie Mahoney who had decorated the tables with brilliant poppy centre pieces. Jo also thanked Paul for arranging his farewell function and complimented Monica and the staff at La Parilla for an exceptional meal. Without everyone’s support such an amazing evening would have simply not been possible. Thirty-nine members and guests of the Coin Branch of the Royal British Legion commemorated Armed Forces day on the 24th of June 2017 with a wonderful lunch at Parilla de Pepe in Coin. 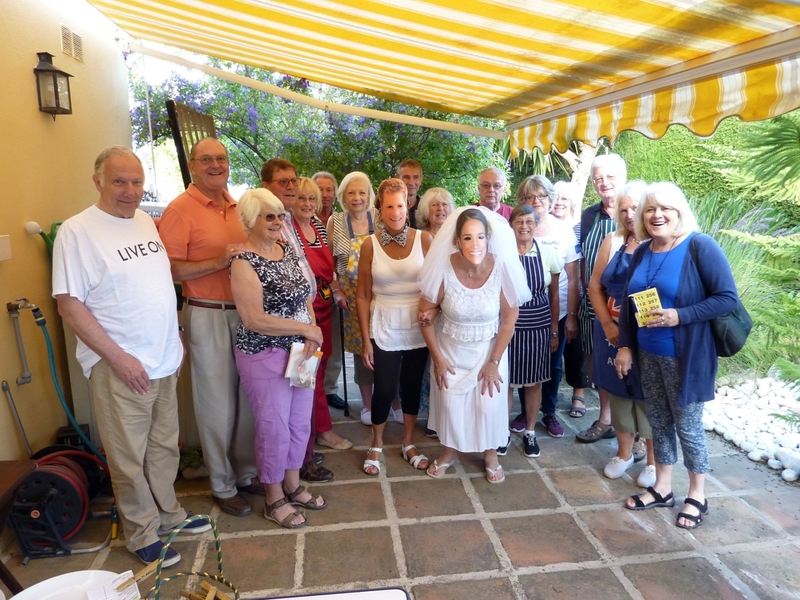 The entire group gathered together at 1.30pm on a sweltering afternoon in Parilla de Pepe’s dining room; fortunately the air-conditioning was on. Poppy Appeal Officer Paul Pritchard had arranged a big screen to show various parades from around the UK and segments from various Royal Tournaments through the years to provide an authentic Armed Forces Day atmosphere here in rural Coin. Russell, the Armed Forces Quizmaster of the day, tested members’ brain power with a challenging themed quiz that covered all three Services as well as a selection of near-impossible dingbats. Thanks to generous donations from David and Eve Simpson the raffle was a major success and altogether almost 200 euros were collected for the 2017 Poppy Appeal. At the end of the meal Chairman of the Branch, Jo Taylor, took the opportunity to thank everyone for coming along to pay tribute to all our active duty servicemen around the world and she wished them safe wherever they were. Fifty-four members and guests of the Coin Branch of the Royal British Legion gathered together under a clear blue sky for the annual breakfast at Rosie’s at 10am on Saturday the 20th of May. The meal got underway with a glass of ice cold orange juice freshly squeezed by PRO Charles Edwards from two huge crates of oranges kindly donated by local grower Bartolome Rojano Madrid. Jean Merry and Maureen Ramayon dressed up in their best waitress uniforms and served the hungry diners a superb selection of food prepared by fourteen eager Masterchef fans ably directed by Social and Fundraising Committee Chairman Peter Brown. Diners could choose whatever they wanted from the full list of English breakfast ingredients bought at the recently established T&S Butchers in Coin. 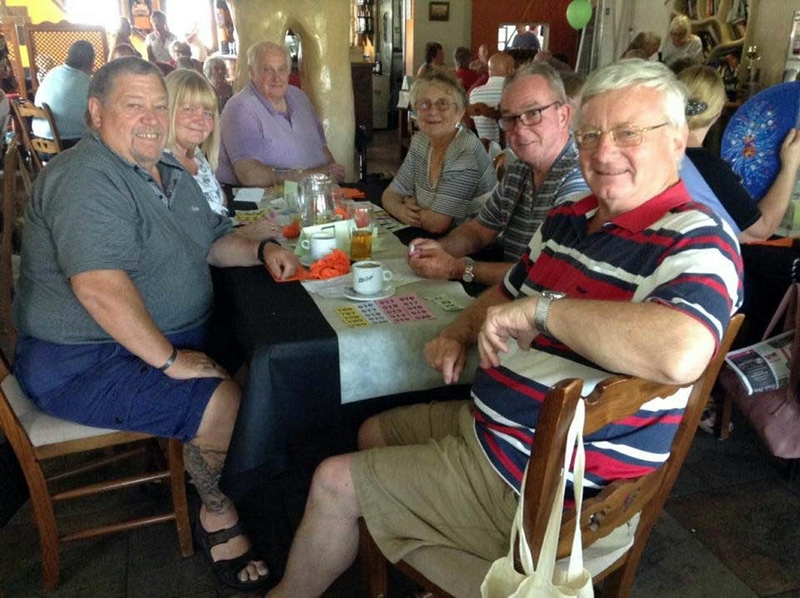 Some diners suggested the bacon, sausages and eggs were among the best they had ever had. One happy diner when encouraged by Chairman Jo Taylor to have two eggs declared that one egg was “an oeuf”. At the end of the meal Jo thanked everyone for coming along and helping to raise over 200 Euros which will go to the 2017 Poppy Appeal. She also thanked the workers for producing such a sumptuous meal with style and a smile. 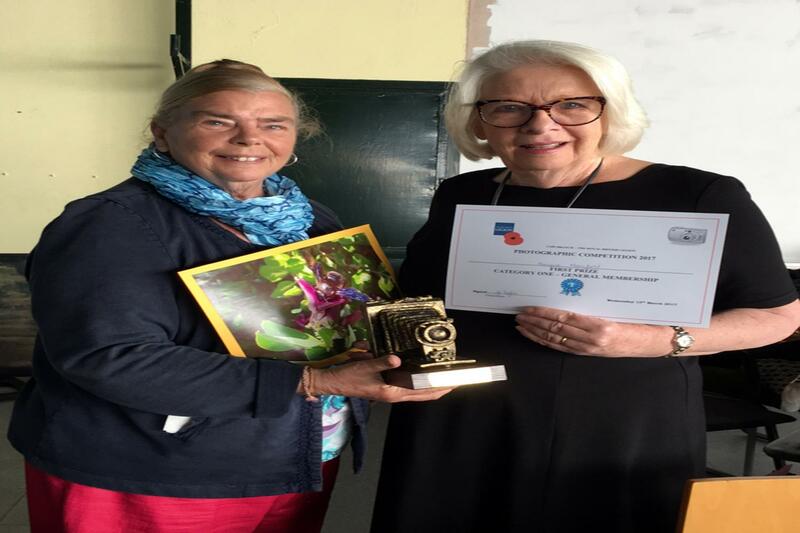 On Wednesday the 26th of April a team of 6 dedicated quizzers from the Coin branch of the Royal British Legion travelled to Loja to try and regain the coveted Michael Taylor Trophy. Michael and his wife Jo, now Chairman of the Coin branch, bought the trophy many years ago and offered it as a prize for the Spain South Annual Quiz. Loja managed to win the trophy from Coin three years ago and every year Coin has tried to win it back but failed narrowly each time – except this year. Against strong opposition from Loja, Torre del Mar, Molina and Mijas Costa, the Coin A team claimed an outstanding victory seven points clear of the field. Congratulations go to team captain Russel together with Heather, Frances, Bob Rayah and Perry. Coin also fielded a B team to run interference for the A team and they came a creditable second just three points behind the winners of the B group. The challenge is on; can Coin retain the trophy in 2018? The Coin Branch of the Royal British Legion held its annual Spring Fair at Parilla de Pepe on Wednesday the 19th of April. Around 50 members entered over a dozen competitions including best spring floral arrangement, best spring photograph, best spring craft and best spring collage, painting, drawing or colouring. Other categories included best jam, marmalade or chutney and best decorated cake or cup cake. 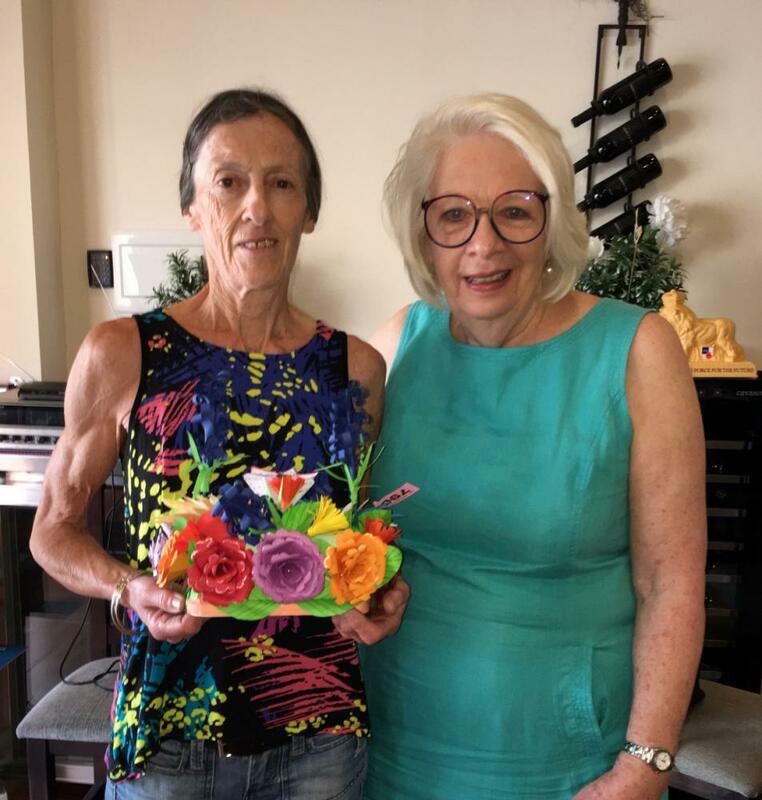 There were far too many winners to mention here but the prize of the day went to Rosey Brown who made a spectacular spring flower arrangement entirely from coloured paper. 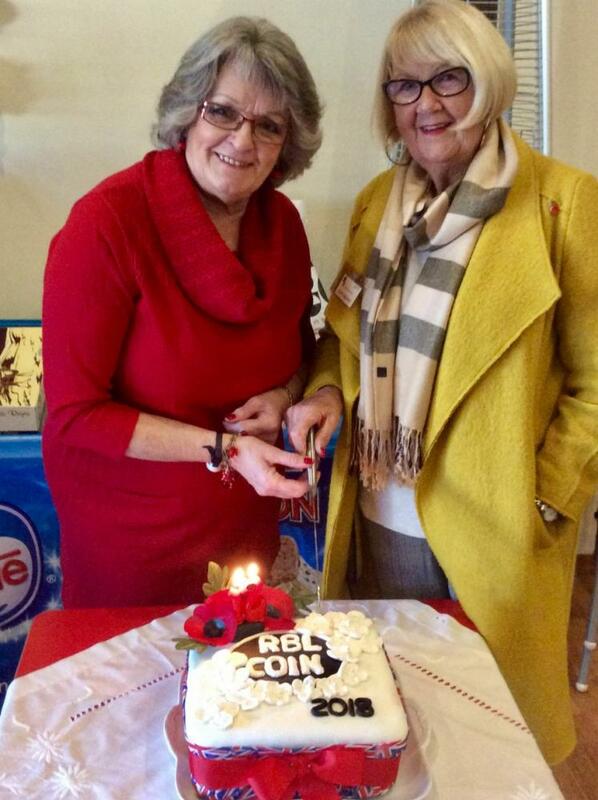 Everyone who entered had put an amazing amount of effort into their submissions this year and the Chairman Jo Taylor sincerely congratulated all those who took part and thanked them for really getting into the spirit of the Coin RBL Spring Fair. If you would like take part in such activities come and meet the people who make up the Coin Branch of the RBL at their new venue at Parilla de Pepe just opposite La Trocha at 11am on the first and third Wednesday of every month. The Coin Branch of the Royal British Legion held its annual Photographic Competition at Yates’s on Wednesday the 15th of March. The subject was Creepy Crawlies and submissions were judged in 2 categories: Category 1 was open to all branch members not in the photographic group; Category 2 was open to members of the Coin RBL photographic group. Category 1 was won by Monique Mansfield and Category 2 was won by Charles Edwards but unfortunately both winners were missing on Presentation Day. However, Chairman Jo Taylor managed to catch them at the Branch Meeting on the 5th of April and present them with their trophies. She thanked everyone for submitting photographs of such a high standard and awarded the Chairman’s choice trophy to Alan Ellis for his superb picture of a European Swallowtail Butterfly taken in the woods near Coin. The lucky winners will keep their trophies until March 2018. 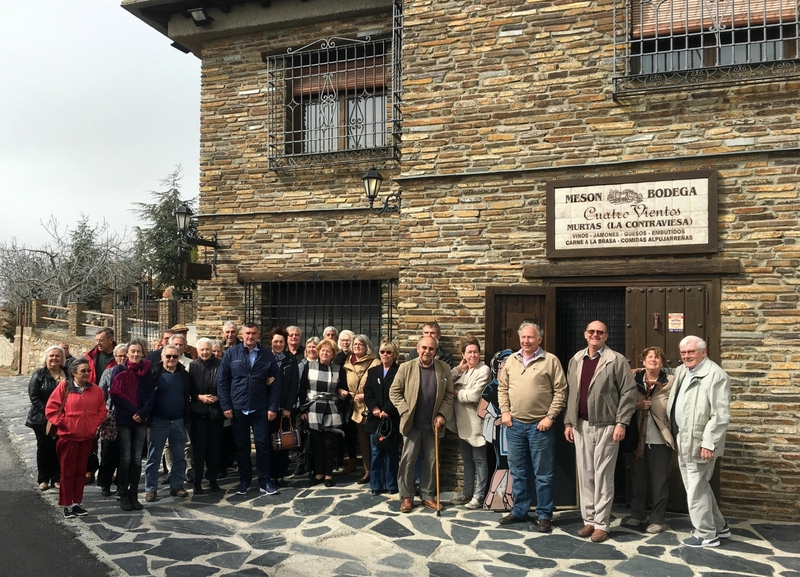 On Tuesday the 21st of February thirty eight members and guests of the Coin Branch of the Royal British Legion enjoyed a remarkable trip to the Bodega Cuatro Vientos in the Sierra de la Contraviesa. Although the bodega is a functioning wine producer it has what is probably the most interesting and comprehensive wine museum in the area. After a smooth a spectacular two-hour drive into the mountains the group was greeted by the bodega staff who did everything they could to make the day rather special. Their incredible tour of the museum was topped off with a multi-media presentation that was both entertaining and informative. When the presentation was over the group was treated to a wine tasting experience where the samples were very generous to say the least. 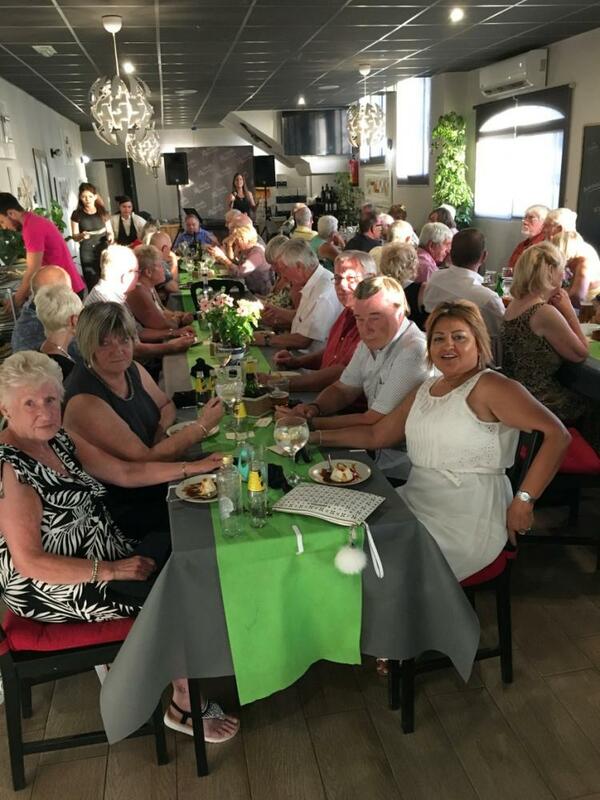 At 2pm the very happy bunch of travellers was escorted to an impressive dining room and served a 3-course lunch that featured a range of food typical of the Alpujarren region. The meal was served with an endless flow of wine and topped off with an amazing cake and cream dessert. 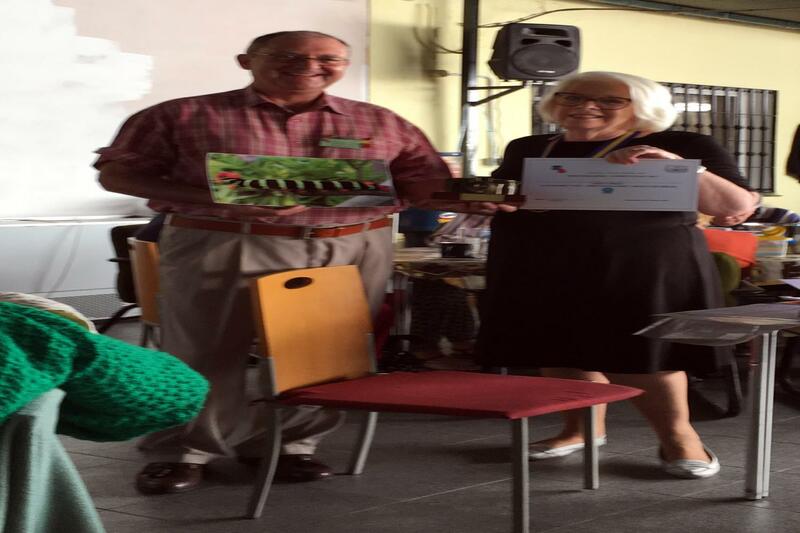 On the way home event coordinator Peter Brown paid special tribute to the trip organiser and coach driver Gloria Bergillos for bringing together such a memorable day. Forty-seven members and guests of the Coin branch of the Royal British Legion gathered at 11am at the Yates’s Family Bar and Restaurant on the 18th of January to celebrate the branch’s 11th birthday. To mark the occasion, Chairman Jo Taylor baked a fantastic fruit cake and Rosie Mahoney used her extensive icing skills to produce a culinary delight that both looked good and tasted delicious. For those who did not like fruit cake an enchanting chocolate log was served as an alternative. After wishing the Branch a happy birthday and leading a round of applause, Jo Taylor reminded everyone that not all the members were well enough to celebrate. She made special mention of Vice Chairman Jim Cross who was in hospital with bronchitis and our oldest member Eris Wallis who was struggling with his health in a particularly tough winter. The branch has enjoyed many day trips to beautiful locations over the last 11 years and Jo summed up the branch’s excursions as simply “a group of friends out for the day “. The next trip on the 21st of February is to Bodega Quatro Vientos in the Sierra de la Contraviesa. The outing includes a tour of the bodega and museum, with samples, and a three-course lunch with wine. If anyone would like to join the group simply email Object or call 663 157 776.